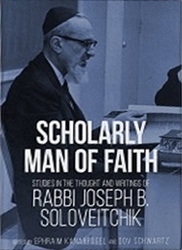 This volume addresses a series of fascinating yet less-explored aspects of Rav Joseph B. Soloveitchik's teachings and thinking. The essays included delve into the Rav's approach toward understanding biblical figures in a comparative light, his views on emotion and intellect and their interrelationship, his appreciation of Yehudah ha-Levi as a seminal Jewish thinker, his unusual understanding of the history of medieval rabbinic literature and the implications for modernity, and his attitude and approach toward scientific method. The volume concludes with an extensive bibliographic survey of contemporary scholarship on Rav Soloveitchik's writings and thought. Long-time students and listeners, and an ever-increasing cadre of newer devotees, will not fail to be deeply impressed and inspired by the range, profundity, and humanity of the Rav's work.